Every now and then, a calamity —either natural or man-made— strikes humanity and just when it appears that no living being could survive the catastrophe, out comes a tree standing brave and resilient among the ruins. There are countless examples of trees that have emerged survivors of disastrous events. They are locally revered as symbols of hope, and cherished for reflecting the courage and spirit of the affected communities. Thanks to the wide coverage by the media, some have found fame and respect beyond their geographical and political boundaries. Let us look at some of these so called “Survivor Trees”. A badly damaged, charred stump of a Callery pear (pyrus calleryana) was pulled out of the rubble of the former Word Trade Center towers in New York City, after it was destroyed by a terrorist attack on September 11, 2001. The tree was planted in the 1970s. When it was recovered, the 8-foot tall tree was in bad shape and had only one living branch. The tree has since been nursed back to health and replanted near the National 9/11 Memorial in Lower Manhattan. Since 2013, seedlings from the Survivor Tree are being distributed, to be planted and cared for, to different communities around the world that have endured tragedy in recent years. Recipients of the Survivor Tree seedlings include victims of mass shooting (Newtown and Killeen, both in the US), victims of typhoons and hurricanes (Joplin, Gulfport and Far Rockaway, all in the US), victims of bombing (Madrid, Spain and Boston, US), as well as other natural calamities such as mud slides (Oso, US )and fire (Prescott). Aside from the Callery pear Survivor Tree, there are six other survivor of the 9/11 attack, all of which are now planted near New York City Hall and the Brooklyn Bridge. On April 19, 1995, a powerful bomb ripped through the Federal Building in downtown Oklahoma City, in the US, killing 168 people and injuring close to 700. Some 650 people were inside the building when the bomb went off. Among the survivors was a hundred-year-old American elm that stood inconspicuous in the parking lot across the street. Workers would arrive early just to be able to park under the tree’s shade. The force of the blast ripped most of the branches from the tree, and glass and debris were embedded in its trunk. The tree was almost chopped down during investigation in order to gather evidences hanging from its branches and embedded in its bark. But the community came together and rescued the tree. Hundreds of saplings of the Survivor Tree, distributed to the public every year, now grows in public and private places all over the United States. When Japan was struck by a tsunami on March 2011, an entire forest on the country’s central Pacific coast was washed away, except for a lone pine tree. Out of 70,000 trees, the 250-year-old Miracle pine tree in Rikuzentakata was the only survivor. Although the tree survived initially, high salinity slowly killed its roots until the tree was dead 18 months later. After that, the 27-meter-tall tree removed and a metal skeleton was inserted into its trunk to preserve its shape. Additionally, replica branches and leaves made from a synthetic resin was added and the tree was returned to its original location. The Miracle Pine after the tsunami (left), and after it was restored and encased in a steel lookout tower (right). After the atomic bomb destroyed large areas of Hiroshima in 1945, one Manhattan Project scientist predicted that the land will be barren of life and nothing will grow for 75 years. But the following spring, to everyone's surprise and delight, new shoots were seen springing up amongst the debris of the city. Aside from those new saplings, hundreds of trees that were near the hypocenter withstood the blast. Though broken and badly charred, they survived and soon were healthy again. These trees sent a powerful message to the survivors and gave them hope that they could rebuild their city. After the war, as many as 170 trees representing 32 different species were preserved in more than 50 locations within a 2km radius of the hypocenter. Today, they are officially registered as A-bombed trees. 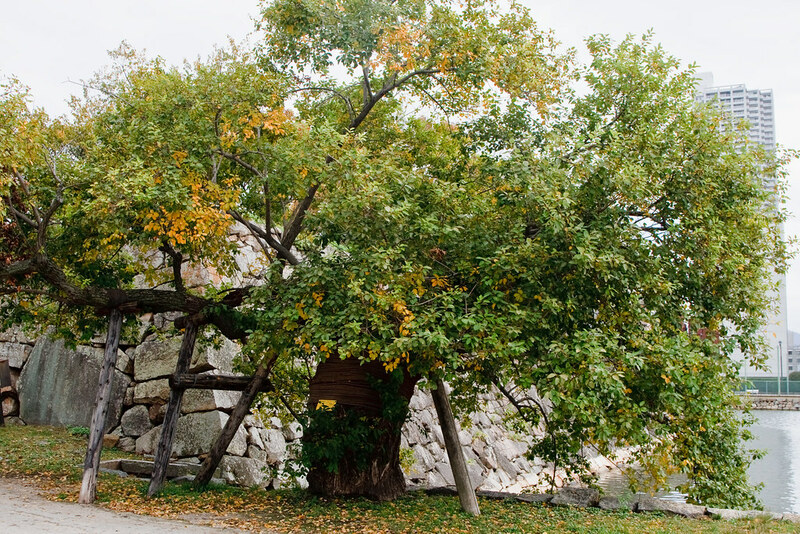 Each A-bombed tree is called a "Hibaku Jumoku" — survivor tree, and is identified by a name plate. The tree closest to the hypocenter is a Weeping Willow, which stands 370 meters away from the blast. Although the original tree was toppled by the bomb, its roots survived and new buds sprouted at the base. Another Weeping Willow stands near Seishonen and the Baseball Stadium, 450 meters away from ground zero. The trees are located all over on the grounds of public buildings, temples, and shrines, and are under the care of the Hiroshima government. Seeds and seedlings from A-bombed trees are shared by the city and Hiroshima citizens with people in Japan and overseas, and these new trees are now growing in places all over the world. In 1992, a Boeing 747 cargo aircraft crashed into apartments in the Bijlmermeer neighborhood of Amsterdam, the Netherlands, killing 43 people. 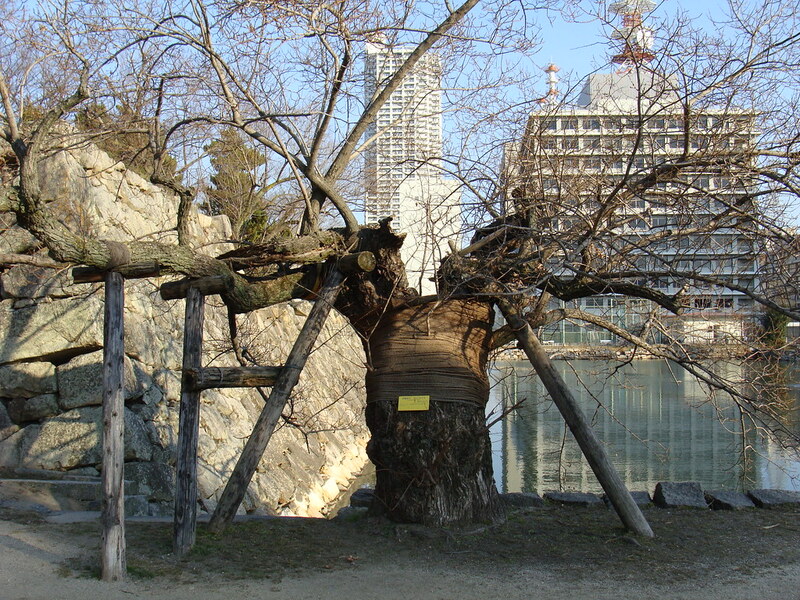 A tree near the edge of the impact survived and was spontaneously converted into a shrine for mourning. The tree is now locally known as “the tree that saw it all” (de boom die alles zag). Flowers are laid at a tree that survived the disaster, and every year a public memorial is held to mark the disaster.